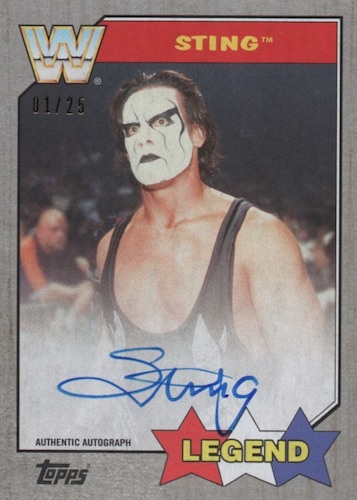 The 2017 Topps WWE Heritage Wrestling checklist allows collectors to obtain the top stars of NXT, Raw, and SmackDown Live, as well as legends, in retro designs. In this case, the design inspiration comes from 1987 Topps Baseball. As part of the two guaranteed box hits for hobby, at least one is an autograph. Utilizing the familiar wood-border look of '87 Topps, the 100-card base checklist works with 24-point Heritage stock. Parallels provide a border color-fill with Bronze (1:2 packs), Blue (#/99), Silver (#/25 - Hobby only), Gold (#/10) and Red (1/1). 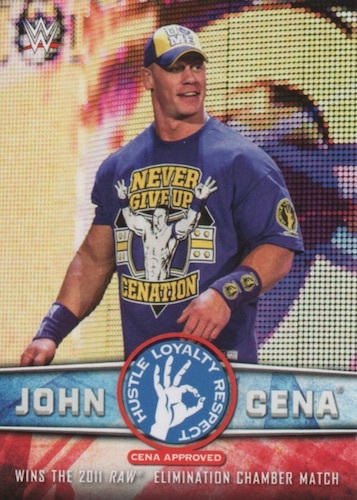 In addition to the continuation of the John Cena Tribute with ten more cards, 2017 Topps WWE Heritage Wrestling has a trio of standard inserts centered around SummerSlam. This includes SummerSlam All-Stars (1 per pack) for the true standouts of past and present, as well as retrospective Bizarre SummerSlam Matches (1:3 packs) and Thirty Years of SummerSlam (2 per pack) sets. 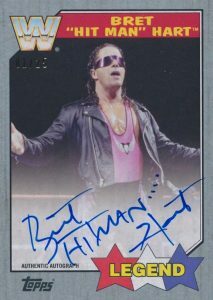 Moving to the hits, 2017 Topps WWE Heritage Wrestling is led by signed cards that are guaranteed to fall one per hobby box. Base Autograph cards largely match the base parallels with Bronze (#/99), Blue (#/50), Silver (#/25 - Hobby only), Gold (#/10) and Red (1/1) editions. There are also Dual Autograph inserts for top pairings with only ten copies for each. Puckering up once again are the Kiss Card inserts for the notable female wrestlers. Numbered to 99, the base version is joined by Gold (#/10) and Red (1/1) relic parallels, as well as Autographed Kiss Card versions (#/25) and matching parallels. 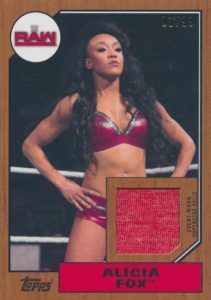 Offering more memorabilia choices, Shirt Relic and Mat Relic cards contain wrestler-worn or event-used pieces and the Commemorative Patch cards showcase multiple manufactured designs, including NXT, Raw, SmackDown Live or WWE Legends. 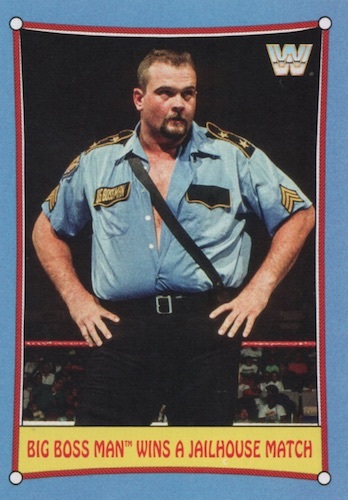 Mat relics get a little more specific with either Survivor Series 2016 or NXT Takeover: Toronto options. Each relic set includes Bronze (#/99), Blue (#/50), Silver (#/25 - Hobby only), Gold (#/10) and Red (1/1) parallels. The mat relics also have Autograph versions, limited to a print run of just ten. PARALLEL CARDS: Bronze #/99, Blue #/50, Silver #/25 (Hobby), Gold #/10, Red 1/1. 10 cards. 1:3 packs. Shop on eBay. 7 cards. Serial Numbered #/99. Shop on eBay. AUTOGRAPHED PARALLELS: Base Autograph #/25, Gold Auto #/10, Red Auto 1/1. 10 cards. Walmart only. Shop on eBay. 30 cards. 1 per pack. Shop on eBay. SummerSlam event year noted below. Good: At least one autograph is guaranteed per hobby box; most base autographs signed on-card; set does a great job evoking the ‘80s feel. Bad: More commemorative relics; tribute cards feel a little out of place; possible 1987 saturation. 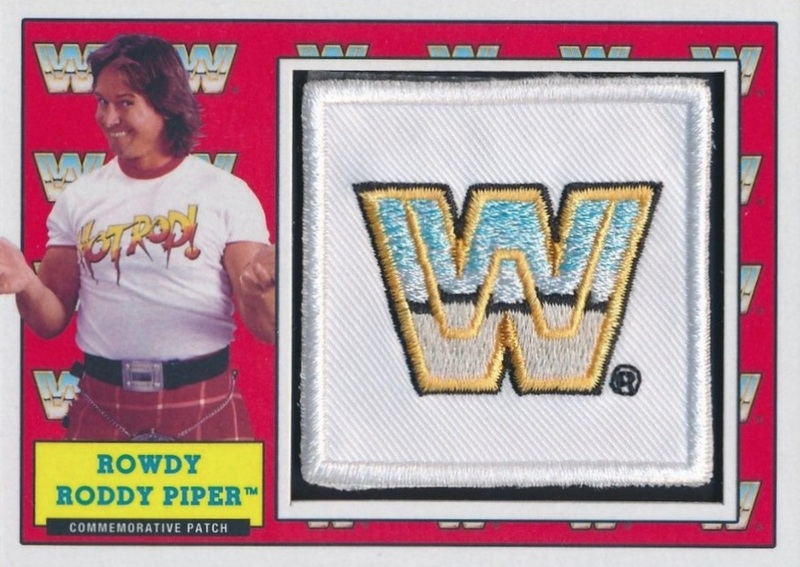 The Bottom Line: With a fair box price and nostalgic designs, WWE collectors have a solid set on their hands as long as they aren't already burned out on the '87 design. Going heavy into 1987 for a low-end set, the jump-and-shout excitement is not likely but the set delivers well for what it is. 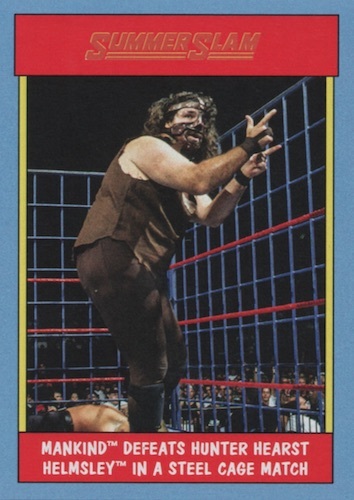 Borrowing the 1987 Topps Baseball design for the base set and looking to 1987 Topps WWF for much of the insert inspiration, 2017 Topps WWE Heritage really seems to transport you to a bygone era of collecting. 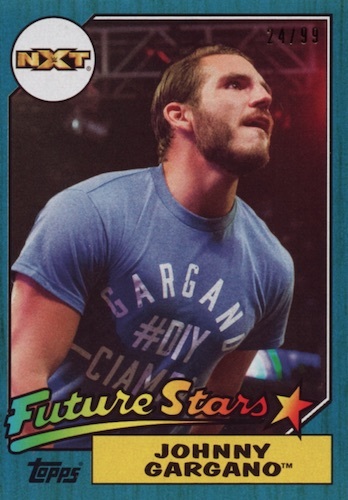 I admit the heavy use of ’87 baseball from Topps across many sets this year is getting to be a little much for me, but it at least feels more fresh for the wrestlers. While the light wood base and bronze parallels are most of what you will see, the other colors (like the blue in our box) do stand out nicely. Although the main autograph set also uses the ’87 design, I appreciate that some of the Legends have different images in comparison to the base cards. Like most, I also like the large area for the on-card signature. 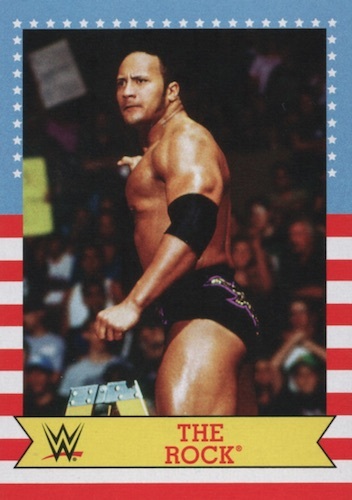 Largely keeping to the theme of the set, SummerSlam is the main insert focus using 1987 WWF designs. They look a bit dated, but I personally like it from the perspective of cohesion. Even most of the hits go 1987 in some fashion. However, the never-ending Tribute cards really come across like misplaced filler here. Maybe Heritage is one set they should sit out in the future. I could also do without the commemorative patch cards which get low marks from me given their higher print runs and boring manufactured logo swatches. Containing just 23 names in the primary autograph set, the fairly tight checklist makes it less of a gamble as most are solid. There is also good representation from the young female stars and all-time legends. Several key names, including Goldberg, Lensar and Undertaker, substitute sticker autographs, but that has been the case for other WWE sets this year, too. As long as you like SummerSlam, there are a lot of choices for set collectors. The three retro inserts provide 90 cards on top of the 100-card base set, so there is a moderate master set to build if you are so inclined. Priced around $65-75 per box, value is pretty good, especially if you have positive memories of the hobby in 1987. With one autograph that is likely signed on-card and numbered, plus a numbered relic, the budget-friendly set is satisfying. While the simplistic nature keeps it from greater value, there are still some bigger hits in play, which is another plus. I’m always torn on these retro sets because they are far too common in the hobby and are easily overdone. Despite this, I liked the mix of designs from baseball and wrestling and did appreciate the effort to apply throwback elements to nearly every aspect. Some of the best looking numbered parallels in a long time. They’re a thing of beauty. My personal favorite set of the year. The design is great and leaves every card, from Base to Relic to Autograph, looking very sharp. Topped off by a great checklist of Kiss Cards and Autographs. The one down note is the number of patch cards that are found in this set. If that’s your thing, then you’ll leave happy! If not, I still believe that this set will win you over with the remaining cards and leave you very satisfied.